Today I would like to share with you a very quick and easy card that I have made using the A Little Note stamp set that is available for just NZ$12 through the Seasonals Expression catalogue which is available until 31 March from my website here. I know the Northern Hemisphere are going through some very cold weather at the moment and I thought this might cheer them up as they look forward to spring. Daffodils always herald the start of spring for me and they are so cheerful after the bleak days of winter. When I first started paper crafting many years ago I started with wet embossing. I was fascinated with how the powder changed to a lovely embossed edge in no time with just a little heat. I was so thrilled to see that CTMH brought out a range of basic colour embossing ink and I love using them on all sorts of cards and embellishments. A little trick with embossing is to use a stamping buddy or a pad made from cornstarch or something similar. This helps stop stray strands of embossing powder ruin your work and also helps the embossing powder stick to the versamark inked image. 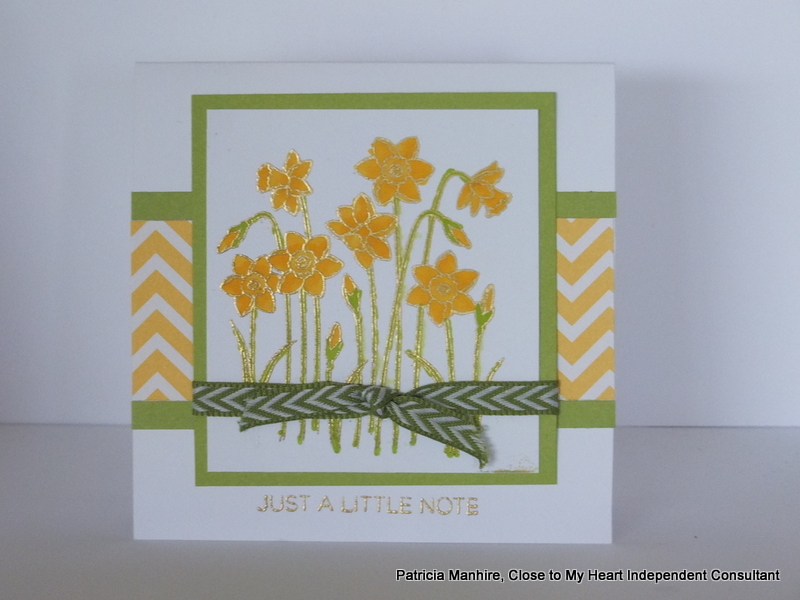 For this card I have made a base card by cutting a piece of White Daisy cardstock 8″ x 4″ to make a 4″ square card. I cut a piece of White Daisy cardstock 3″ x 3 1/4″ and after using my stamping buddy I have stamped the image with Versamark ink and then sprinkled the Ranger gold embossing powder generously over it. After shaking the excess powder off I then used my heat gun to melt the powder to give the lovely embossed finish. I used my ShinHan Touch Twin markers – Marigold, Golden Yellow and Sap Green – to colour in the images. As my hands haven’t been very good lately, embossing and then colouring in was a good option for me. I then matted the image with Pear cardstock 3 1/4″ by 3 1/2″ For the base card I have placed a strip of yellow chevron paper from the Whimsy Paper Fundamentals Papers – 1 1/2″ x 4″ and then placed two strips of Pear cardstock 1/4″ x ” on either side of it. I then embossed the sentiment below it from the same stamp set using the technique outlined above. Before placing the stamped image on the base card I placed piece of Topiary Chevron Ribbon to tie the image together and add some dimension. These cards and others are available for sale at my shop Gift Hutt. I will be moving shop to a larger shop at the end of this month and will be looking at starting to do some workshops and classes from next month.